Wearable Buff Visual Effects or Something Similar? It is possible to make an outfit that places a visual effect of buff (I don't know what it's called) on a sim when they are wearing it? Is there a way to make a mod that kinda replicates the Fame Glow on celebrity sims, but makes it something else like fire, or sparkles, or flies? 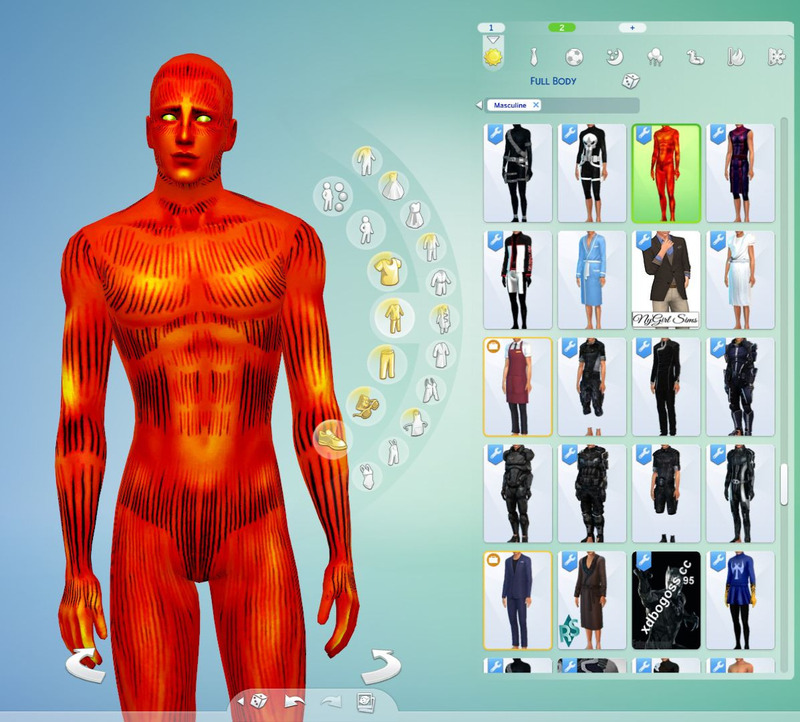 I would like to make a harmless, wearable, fiery body suit for my Human torch sim, but I don't know if this is something I can do, or even where to start. Anybody have any ideas? Do you mean kind of like the photo below - something that is a CAS-only buff that can be applied and removed with a simple change of outfit, or made 'permanent' by applying the buff to a tattoo? I think that you and I could have a discussion about your desire... : ) Cheers! Yes! Something like your photo, but only flames, head to toes. I don't think I want smoke or anything else. In this first photo is the outfit he wears when he's NOT on fire. 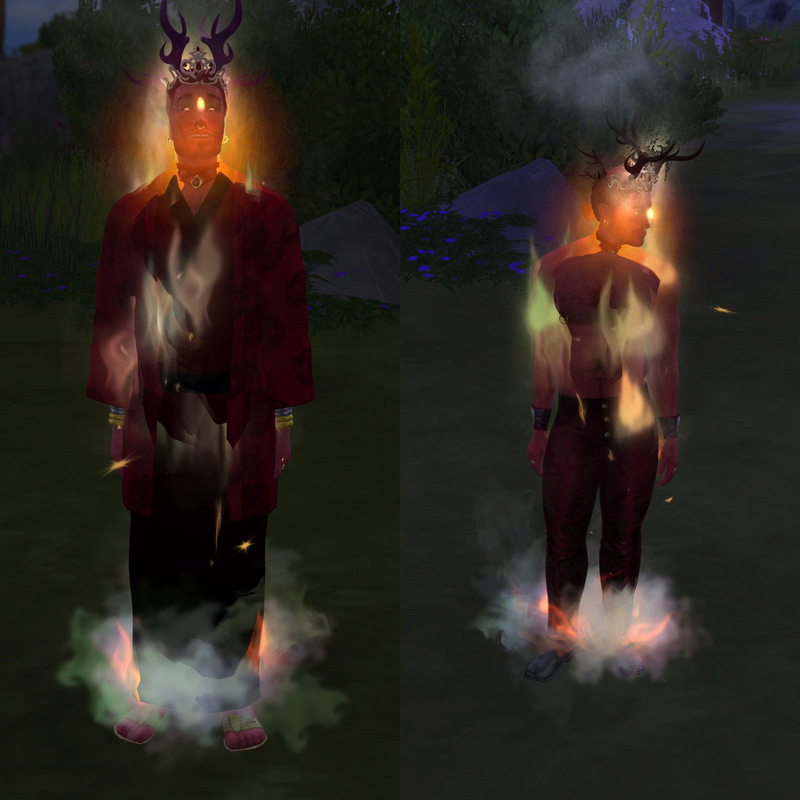 I want to make it so that depending on what outfit he is wearing, it will look like he's on fire, but doesn't catch other things on fire. 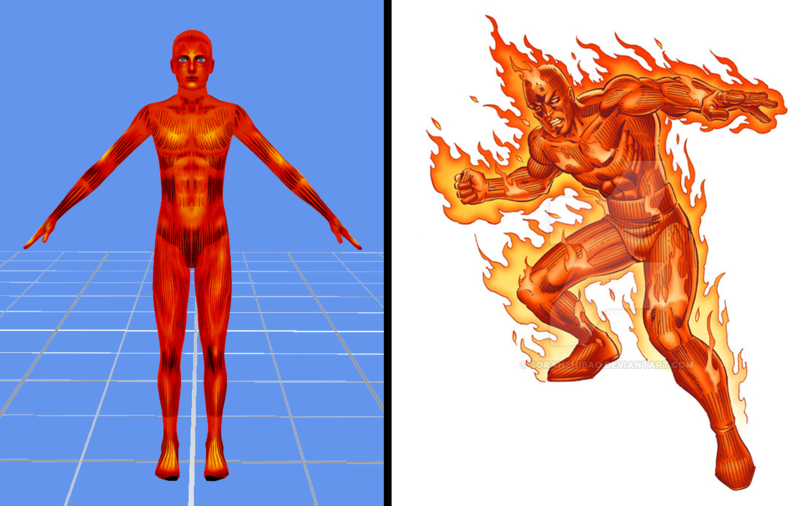 Most of the time, Johnny is not on fire, but I want something like a "Human Torch mode"
If I could apply the fire effects to only work on THIS outfit, I would love to try that. When he is NOT wearing this, he won't have the fire anymore. Only for the Human Torch outfit. Is this something that can be done? I would love to learn! I know how to do SOME things in Blender or Sims4Studio, so that should help! 1) Download THIS file from SFS. It is a clone of the BGyfLeftHandRingMarquise, that is now only for males. Within it are six different sets of tunings that I put together, for various kinds of 'deities'. 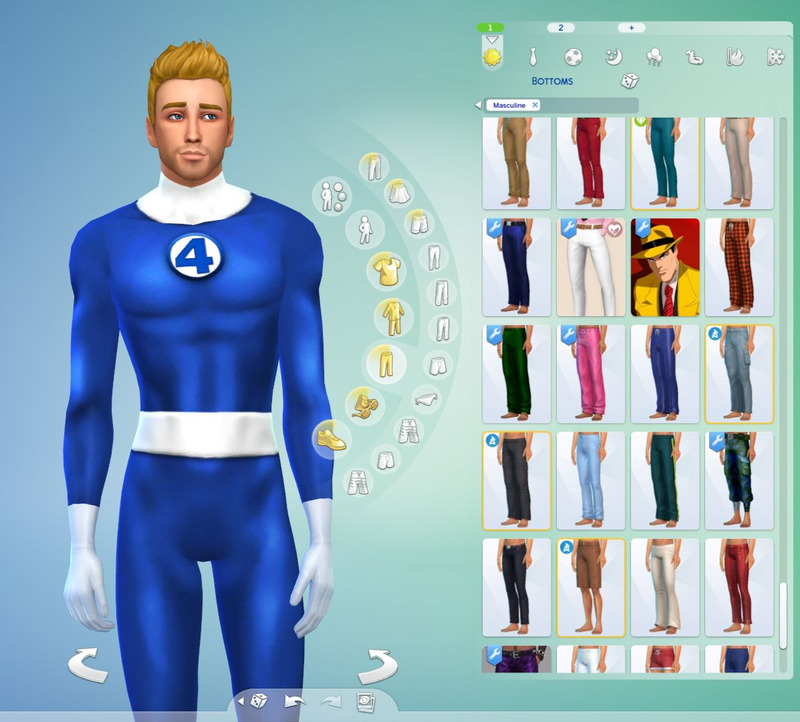 That is for you to check out how well it operates in-game, as well as having the tunings as a guide for you to make the Human Torch for yourself. The added idle interactions are entirely optional to use, so you could eliminate them from your version, or find one that suits you better. The tunings are assigned to a different stone color on the ring. The essential place to put the buff tuning is in the CAS Part resource, hashed by buff name with the buff type of 6017E896 (Clothing Buffs). 2) Go to Andrew's Creator Studio HERE in the S4S forums, and download his list of up-to-date FX. That is what I used to find each of the FX that I chose for each kind of 'deity'. It is possibly my #1 most treasured resource for making Sims 4 CC. Notes about the FX and the Sim rig: Not all of the FX are usable, as some are 'one-off' kind of FX that fire upon application but do not loop. Some are dependent upon certain triggers, so cannot be used. It is all a hit-or-miss kind of thing to experiment with... Also, be aware that *most* of the bones in the Sim rig are 'pointing' straight forward from the Sim, so if using non-Sim based FX, you need to keep that in mind. This ring-style application is exactly what you are looking for, as it will only trigger the FX when an outfit that has the ring is worn. As I hinted earlier, if one would want the FX to be 'always on', then the technique could be applied to a tattoo or some such, which is something that does not change per outfit. If you have ANY questions or need any further assistance, Please let me know and I will help you through your issue! Cheers! I will try this out. Thank you! I can't wait to start! How are the effects tied to specific swatches though? Can I change the spawning nodes based on each swatch too (Only head) or does that have to be a separate package? He's pretty much where I want him now, but I might keep tweaking him. Thank you for your help and the lesson!